One of the things on my “bucket list” of things to do in my life is to go to a dim sum restaurant and have all sorts of different dim sum courses. I love small plate meals (and if I ever get to Spain, I’m definitely trying tapas) and one of my comfort meals is to whip out some pre-made gyoza (potstickers) to reheat for a snack. Unfortunately, making potstickers and other dumplings can be very time-consuming and is best done with friends or family. I usually wind up deciding to make a whole meal of dim sum, which means making at least three different types for dinner — and invariably, I forget just how time-consuming it is and dinner is late by hours. So I heartily recommend doing this in the afternoon and covering the finished dumplings with a damp paper towel until it’s time to cook dinner. I also thought I would do something different for this post: Because the pleating is difficult to describe if you’ve never done it before or eaten one of these as part of a dim sum course or meal, I recorded how I construct them. I’m not that great – largely because I don’t make these very often and also I get nervous being in front of the camera, but it should give you an idea of how to go about it. Combine cilantro, green onions and garlic in a food processor, chop finely. Add cabbage and apple, process until finely chopped. Remove to a bowl, mix in ginger, soy sauce, oyster sauce and chile flakes, then stir in chicken or protein. Set aside a small bowl full of water at your workspace. Lay out a gyoza wrapper, leaving the rest under a damp paper towel so they don’t dry out. Place about 1 tablespoon’s worth in the center and dampen the outside edge of the wrapper. Gather the edge up and pleat, squeezing the pleats together so that the wrapper stands up around the filling. Add more filling so that the little “pouch” is full (cabbage cooks down quite a bit, so you want it to rise a little above). 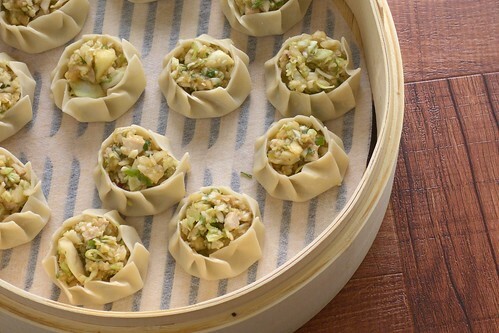 Place the siu mai in a bamboo steamer that has been lined with a steamer liner or cabbage leaves2. Steam for 9 – 10 minutes. You can also use parchment, but cutting some holes is probably a good idea. This entry was posted in asian, chicken, chinese, dairy-free, gluten-free, recipes, side, snack, untranslated, vegan, vegetarian. Bookmark the permalink. I’ve never had dim sum before, but this looks delish! I’m going to have to give this a try soon.